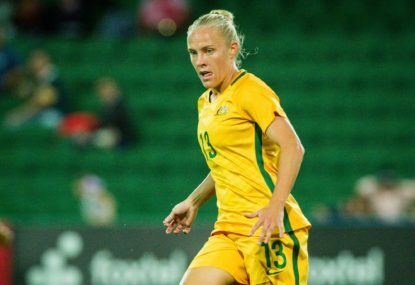 Australia have missed a golden opportunity to head into next year’s Women’s World Cup as Asian champions after suffering an 11th-hour defeat against Japan in Amman. 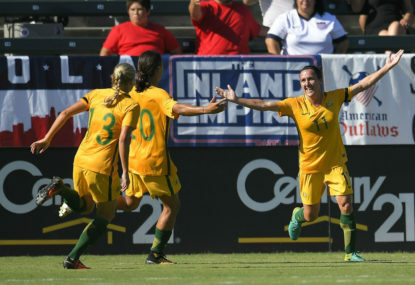 Australia’s Women’s Asian Cup campaign is well and truly back on track following an 8-0 win over an outclassed Vietnam in Jordan. Warringah will carry sentimental favouritism when they line up against reigning premiers Northern Suburbs in the Shute Shield final on Saturday. David Warner finally found form to hit the highest score by an Australian batsman in Sri Lanka and lift his side to a comfortable five-wicket win for a 4-1 series victory margin. Australia are focused on ending their one-day series against Sri Lanka on a positive note after claiming an unassailable 3-1 lead on Wednesday with a revitalising six-wicket victory. 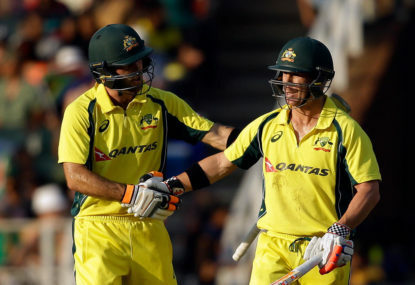 A remarkable half-century from Aaron Finch has lifted Australia to a seven-wicket win over Sri Lanka for an unassailable 3-1 lead in the one-day international series. Tim Cahill’s first home game for Melbourne City will be against Western Sydney Wanderers after the latter won their way into the FFA Cup quarter-finals on Tuesday. Defender Scott Neville was the unlikely goal-scoring hero as Western Sydney Wanderers won their way into the FFA Cup quarter-finals on Tuesday. Australia captain Steve Smith is to fly home from Sri Lanka following defeat in the second ODI in Colombo after a decision was made by national selector Rod Marsh to rest the 27-year-old. A hat-trick from James Faulkner and a gritty Mathew Wade half-century were to no avail as Australia crumbled to a hefty 82-run defeat against Sri Lanka in Colombo on Wednesday. New W-League club Melbourne City had one last hurdle to clear to confirm their championship favouritism, and they did that emphatically with a 4-2 win over reigning champions Canberra United on Sunday. Buoyed by the availability of their in-form Test stars, NSW appear unstoppable after they eased into next weekend’s one-day cup cricket final. All eyes were on former Greek international Kostas Katsouranis, but it was Socceroo midfielder Aaron Mooy who stole the show as Melbourne City advanced to their maiden FFA Cup semi-final. FFA Cup holders Adelaide United have seen their reign ended as Melbourne Victory eased to a 3-1 win at AAMI Park, though their win was soured by a potentially serious knee injury to club icon Archie Thompson. FFA Cup holders Adelaide United have maintained their hopes of back-to-back titles with a dramatic 2-1 extra-time win over Sydney FC. Wellington Phoenix have taken a step towards rediscovering last season’s winning momentum with a hard-fought 1-0 FFA Cup victory over Central Coast Mariners, while Perth Glory and Western Sydney Wanderers also advanced to the last 16 on Tuesday. FFA Cup holders Adelaide United opened their title defence on Wednesday night with a 6-1 victory over Darwin Olympic, while fellow A-League team Sydney FC also progressed to the round of 16 with a routine 2-0 win against Sorrento FC in Perth. Melbourne Victory coach Kevin Muscat says his side have laid a strong initial platform for their A-League title defence, following their one-sided 6-0 FFA Cup win over the Balmain Tigers. Melbourne’s two A-League clubs avoided potential FFA Cup major upsets by recording away wins on Tuesday, albeit in vastly contrasting fashion. All-rounder Ellyse Perry led an impressive comeback with the ball as Australia claimed a 53-run win over the West Indies and a 2-0 lead in the four-match one-day series.